Exciting news as some of the first unheard Fela Kuti recordings to surface in 20 years are due to be released in a joint collaboration between German label Strut Records and US label Knitting Factory. 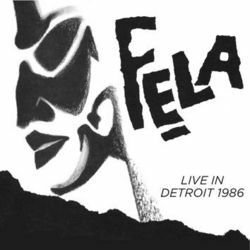 The recordings are part of a live session done on Fela's US debut tour with the new Egypt 80 band in 1986 just two months after he was released from imprisonment by the Nigerian government following an Amnesty International campaign. The concert took place at the Fox Theater in Detroit and features live cuts of "Just Like That", "Confusion Break Bones", "Teacher Don't Teach Me Nonsense" and Beasts of No Nation". The songs featured here, the shortest clocking in at 29 minutes and 35 seconds, aren’t among Fela’s best known compositions, though they did feature on studio albums with the Egypt 80 band. It’s in these unbridled live performances though that the material truly comes alive, complete with audience interaction, the incredible musicianship of the band, and Kuti’s inimitable vocal stylings. Double CD, 4 x LP gatefold or Digital Download. (Strut095CD/LP). It will be released worldwide by Strut, and in the US by Knitting Factory. "Strut team up with New York’s Knitting Factory for the exclusive worldwide release of ‘Live In Detroit, 1986’, the first new Fela Kuti material to be issued since his final studio album, ‘Underground System’, in 1992. Recorded live at the Fox Theater in Detroit in November 1986, the concert marked a triumphant return to the USA for Nigeria’s Afrobeat master, Fela Anikulapo Kuti. He had tried to leave his home country to tour the States two years earlier before being arrested and imprisoned on dubious charges of “currency trafficking”. An Amnesty International campaign helped secure his release in April 1986 and, just two months’ later, he appeared on stage as part of Amnesty’s ‘Conspiracy Of Hope’ American tour. The evening's audio recorder, Bob Teagan, claimed the '86 Fox Theater show to be Fela's best performance, "It was like seeing Bob Marley, Frank Sinatra, Michael Jackson, Marvin Gaye, and James Brown all rolled into one. Fela captured the revolution of Marley, the love of Marvin Gaye, he sung with a rare and exquisite charcoal voice like Sinatra but he would scream himself out and go hoarse by the end of the three hour marathon show. All the while he danced like Michael Jackson or a ballerina, and captivated the crowd with the showmanship of James Brown." The Detroit concert was part of Fela’s debut US tour with his Egypt 80 band and the recording finds them on strident form, showcasing all-new material in free-flowing extended workouts: ‘Just Like That’ recalls Fela’s memories of the Nigerian Civil War; ‘Confusion Break Bones’ (an update of his earlier track, ‘Confusion’), compares the present African situation to a permanent traffic jam at a town centre crossroads; ‘Teacher Don’t Teach Me Nonsense’ swipes at the oyinbos (white men) forcing sham versions of democracy on Africa and allowing "democratic" rulers to line their own pockets at the expense of the people while foreign-owned multi-nationals are allowed to freely strip the continent of its natural resources; ‘Beasts Of No Nation’ reflects on Fela’s recent court case and imprisonment in Nigeria and, more widely, on the issues around Apartheid. The messages here resonate as powerfully as anything from Fela’s career. The tracks featured in the concert would appear on studio albums: ‘Teacher Don’t Teach Me Nonsense’ during the same year, produced with Compass Point studios mainstay Wally Badarou, then ‘Beasts Of No Nation’ and ‘O.D.O.O. (Overtake Don Overtake Overtake)’ in 1989. Often overlooked in favour of the punchier sound of Fela’s recordings with Africa 70, these later recordings are deeply soulful affairs, at times melancholy, marked by lengthy, complex and freeform arrangements. ‘Live In Detroit 1986’ is released on May 8th by Knitting Factory in the USA and Strut for the rest of the world."